Annual International Sunday AND Beyond Idols Worship Tour in the same day!! March 14th- starting at 9:30am! International Sunday features a celebration of the more than 35 nations represented in our congregation. 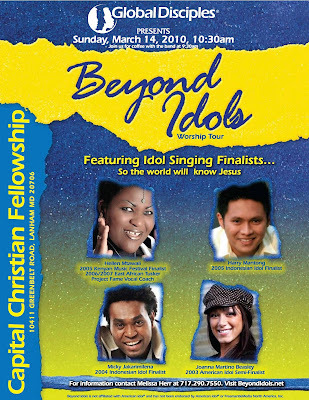 And the Beyond Idols is a concert tour consisting of American Idol type contestants from around the world singing to lift up the name of Jesus! This is going to be an extremely special moment in our church. CLICK HERE for more info about Beyond Idols.